There is so much holiday magic swirling all around us, just waiting to be harnessed! These stunning Yuletide aura ornaments are such a powerful way to capture all of this magic. Made out of iridescent red and green aura quartz, these enchanting pieces are just reverberating with uplifting, peace-bringing energy, and will make for the perfect addition to your Christmas tree or sacred space as you celebrate the beauty of the season! I absolutely adore working with aura quartz. This gem is created when pure solid gold and iridium are bonded to clear quartz – and the result is stunning, illuminated material. These Yuletide aura ornaments are practically glowing in shades of brilliant, cosmic green and gorgeous, cherry red, and each has been adorned with an enchanting snowflake charm. 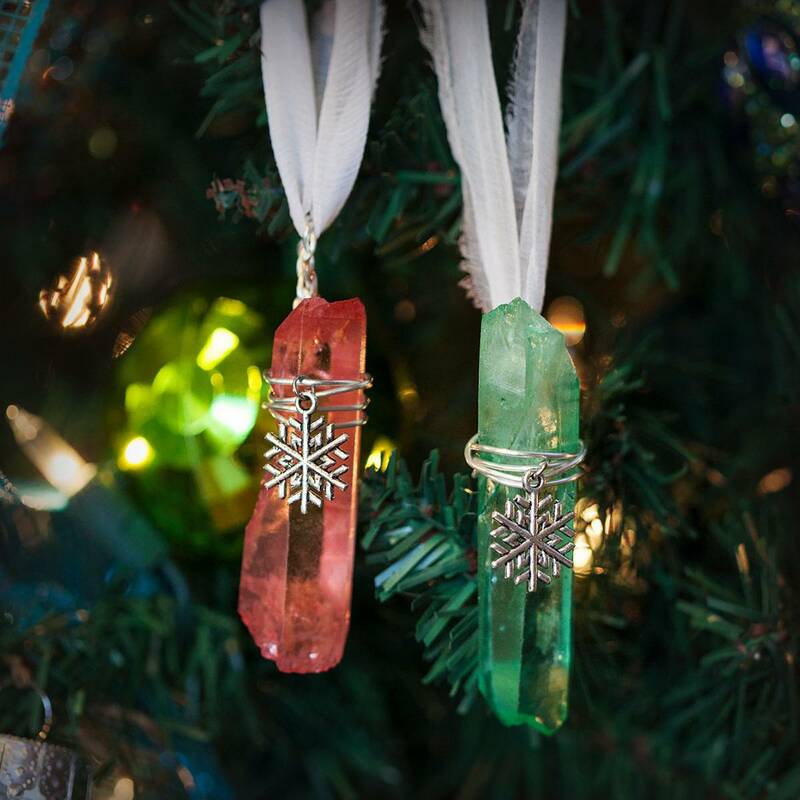 And not only are these Yuletide aura ornaments beautiful – they’re also incredibly energetically potent. When you work with aura quartz crystals, you powerfully expand your consciousness and experience potent physical and spiritual healing. Work with these ornaments and you’ll immediately feel your body and spirit being stimulated by the powerful vibrations of this sacred stone! This listing is for one (1) Yuletide aura ornament, approximately 1.5” in size. Yours will arrive lovingly parceled and adorned with a white sari silk ribbon bow, ready for hanging. You will receive either a red or green ornament – please allow us to intuitively choose your color for you.